Learning how to play blues guitar is a relatively simple process if you know and understand all the basics. 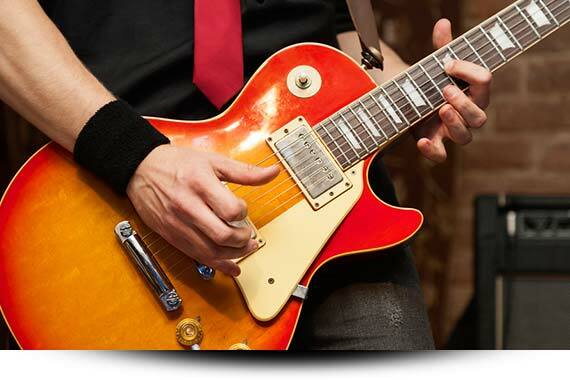 Follow our easy beginners guide below with corresponding videos to quickly learn blues guitar! “Classic Blues”: This refers to the first blues standards popularized in the 1920s, by bluesmen Robert Johnson and Muddy Waters, just to name a few. “Electric Blues”: This style emerged when blues musicians started to incorporate the electric guitar and electric bass into their ensembles. Each area of the country then started to develop their own blues style including “Texas Blues”, “Chicago Blues”, and so on. “Country Blues”: Featuring complex picking arrangements on the acoustic guitar, country blues became popularized by players like Mississippi John Hurt and Big Bill Broonzy. If you want to learn how to play the blues guitar, you need to first understand its underlying structure, how it differs from learning how to play guitar in general and how the chord progressions are formulated, because everything is based off that. The most common chord progression in Blues is the 12 bar progression and it usually has 3 chords. These Chords are the I IV and V (“one, “four, “five”) of a tonality or key. In traditional music theory, those chords are also referred to as the root, the subdominant and the dominant. The interesting thing here is that if you build a chord off each degree of the (major) scale, you’ll get a combination of major, minor, and dominant chords… But in blues, the most common progression is to use all dominant chords (or “dominant 7th”) chords. There are endless variations to the basic 12 bar blues chord progression. The last 2 bars of the 12 bars are referred to as a turnaround because the progression “turns around” before heading back to the beginning. One of the most common variations on the above 12 bar blues is to use a “I V” on the last 2 bars , rather than “I I”.Another extremely common way to vary the 12 bar progression is a known as the “quick 4”, meaning that the progression goes to a IV chord immediately on the second bar. The minor blues structure is nearly the same as for “normal” blues or major or Dominant tonalities. The only difference is that you would primarily be using minor chords or minor 7 chords. For example, a blues in Cm would use Cm, Fm, and Gm. Of course, there are endless variations. One popular maneuver is to play VI (Maj7) to V7 on bars 9 and 10. This change was made famous in B.B. King’s recording of “The Thrill is Gone”. In a Bm blues, those chords would be Gmaj7 to F#7, which we’ll see later on this page. The 4/4 rhythm: This is the most common time signature in occidental (western) music. Technically, 4/4 means 4 notes to a bar, and the quarter note gets the beat, but in practical terms you can just think of this as a “ONE TWO THREE FOUR” count. It’s a very easy feel because it’s the natural pulse we get when we tap our feet on the floor. Triplet feel: This is one a common basis for the rhythms in blues. It’s basically like the 4/4 rhythm, but divided into 3 notes per beat. This could also be seen as 12/8, and is often notated that way. Chords in blues depend on the song, the style, and the performer and are key to learning how to play blues guitar for beginners. They can be basic major and minor chords, or they can complex chords with extensions and substitutions and more of what you might expect in a jazz or fusion setting. 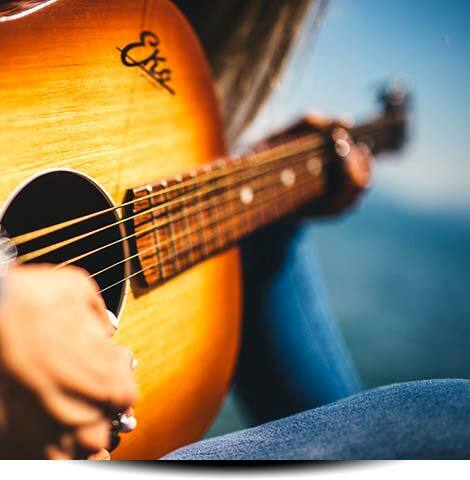 Be sure that you understand and learn guitar chords well enough to continue. Remember that the most important thing is first the structure, then the rhythm inside that structure, and then the chords. 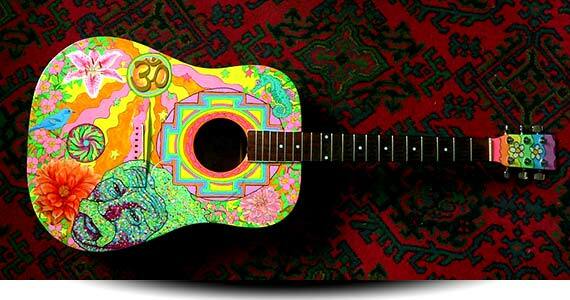 So, no matter what chords you play, if you respect the I IV V structure you will sound bluesy. Here are some chord voicings you can use for the C7, F7, and G7 chords. Major 7th chords: These are major chords with an added major 7th. So they have a root, a major 3rd, a perfect 5th and major 7th. Minor 7th and Major 7th chords are pretty common in minor blues progressions or songs. Jimi Hendrix popularized the use of the dominant #9 chord in songs like Purple Haze making it one of the best blues songs to learn if you want to learn how to play complete songs on guitar. You can also use it blues as a substitute for a dominant chord. You can see we did that here in the arrangement above.This chord contains the root, major 3rd, perfect 5th, minor 7th and an augmented 9th. Another great chord used all the time by blues guitarists. 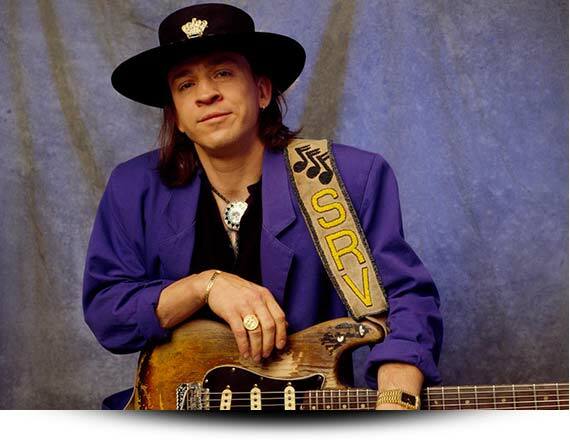 Stevie Ray Vaughan loved these chords. You will too. The nice thing is that you can substitute any 7th chord with a dominant 9 chord.The formula is technically a(root, major 3rd, perfect 5th, minor 7th, plus a major 9th. In practice, and in general when you chords with a lot of notes, you don’t need to necessarily play all the notes because the guitar also has 6 strings and it can become awkward to find the right voicing. Often the fifth is omitted, and the most common voicing does just that. An even more exotic version of the Dom9 chord, this one also adds a 13th, which is an octave higher than the 6th degree. 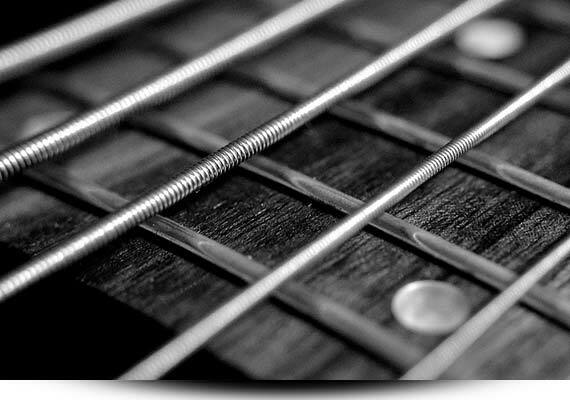 Higher notes that are added onto basic chords are called “extensions”. 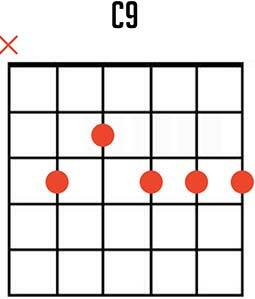 Notice this is the same shape as the C9 chord except there’s an additional note on the high E string, which you should play with your pinky.As with the Dom9 chord, you can substitute them for your ordinary garden variety Dom7 chords most of the time in a 12 bar blues progression. 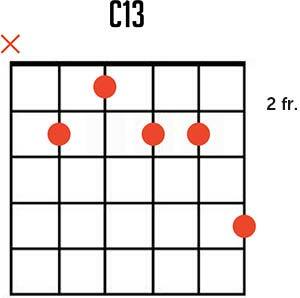 And here are a few more alternate voicings for the C13 chord. This is a more advanced chord that you can use either to substitute for dominant chords, or as a passing chord. Try replacing a dominant 7th by a diminished 7th up a major 3rd. This will create a 7b9 sound. For example, for G7 play Bdim and you will get a G7b9 sound. You can hear this chord at the end in chord progression from the classic “Stormy monday”. The last 2 bars of a 12 bar blues progression is usually known as the turnaround, although it could also be the last 4 bars. 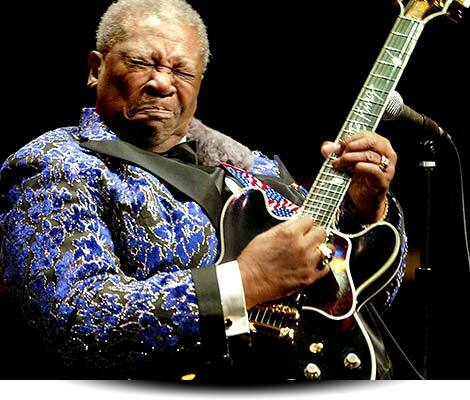 Very often, in blues guitar, the turnaround is a specific riff or lick rather than just a chord being played. Actually, there are hundreds of different ways to play turnarounds. They can involve full chords, single note lines, chromatic notes, diminished chords, and many other techniques. It depends on the specific style of blues, the song, and the player. For example, modern stylists like Robben Ford will add more jazzy elements than a classic blues player like BB King. Here’s an example of a 2 bar turnaround in the key of E, and notice the use of open strings, triplet feel notes, as well as some bends. And here is a third E blues turnaround. Notice this very cool idea: getting a fuller sound with wide intervals. As you study and learn more blues turnarounds and licks, notice how you can add open strings to fill out the sound, as well. Here’s one in the key of A. You’ll see that many of these blues turnarounds feature chromaticism, which means the notes ascend or descend one fret at a time, rather than following an ordinary scale. Here’s one more, similar to the previous example, and using a pattern with 6th intervals as we bounce between the G and high E string. This is another common idea you’ll see in blues guitar. There’s a few main scales that are used for playing the blues: These include the minor pentatonic scale, the major pentatonic scale, and the so-called “blues scale”.“Penta” is latin for 5, and guess what, pentatonics are 5 note scales. Actually, there are many possible pentatonic scales, but the main one is often just called THE pentatonic scale, or more accurately: the minor pentatonic scale. The nice thing about pentatonic scales is how they overlap with the diatonic (major/minor) scales. For example, if you take a C major scale, and remove the 4th and 7th degrees, you’ll get a C major pentatonic scale. Same thing happens with the minor scale. Take the A minor scale, and remove the 2nd and 6th degrees, and you get A minor pentatonic. You could write a dozen books on all the various ways to use the scales, but in short: You can pretty much use the minor pentatonic scale anywhere, and you can use the major pentatonic scale over any major blues or major chord. A variation to the minor pentatonic scale is known as “the blues scale” and it simply adds one extra note, which is the b5 (flat fifth), sometimes called “the blue note”. This note can be added to licks as a passing note. You can use many other scales in blues such the natural major scale or the natural minor scale. You can also use the Dorian mode and the Mixolydian mode.The Dorian mode is a minor scale with a major 6th. A good way to see the structure and to understand from where it comes, is to compare it to it’s parent scale. Try playing the a D Dorian mode over a D minor blues progression. It sounds great over those minor 7 chords. 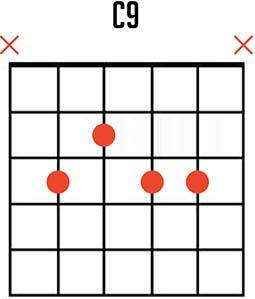 Here is a tab for a C Dorian mode (or C Dorian scale). The Mixolydian Mode is another great scale. You can think of this one as a major scale but with the minor or dominant 7th degree. If you’ve ever played a 2-note blues lick with the root and the pentatonic note that’s 1 note down (like in the key of A: the notes A and G), then this is sound you combine with the major scale.So in the key of A, an A major scale that uses the G instead of G# would be an A Mixolydian. This scale is perfect for major blues progressions and especially for playing over dominant 7th chords because of that 7th interval we just talked about. Here’s the tab for the G mixolydian scale. Well that’s about it for now, my friend. I hope you’ve enjoyed this primer on blues guitar. In reality, you can’t just learn how to play the blues guitar (or any music for that matter) by just reading about it. Blues is about a vibe and a feeling. Becoming a better musician comes from playing, practicing, performing, and listening. Join our email list for free resources to help you learn and master blues guitar!